Las Vegas - MGM Resorts International techs see it all. Sound system requests can be for a single lavaliere microphone setup for a business meeting in the morning, a DJ-fueled and bikini-filled pool party at lunch, a prize fight weigh-in with a mariachi band in a ballroom in the afternoon, and then a headline act in an arena in the evening. When the biggest chain of mega resorts in the Entertainment Capital of the World needed a new system that was both versatile and stellar sounding, it turned to L-Acoustics and a system based on the compact KARA line of loudspeakers. It's no exaggeration to say that MGM Resorts is an empire. Growing from a single hotel and casino in the '70s to a conglomerate that now stretches from Circus Circus at the north end of the Strip to Mandalay Bay at the south end, MGM Resorts today encompasses more than a dozen properties in that short stretch of desert alone. 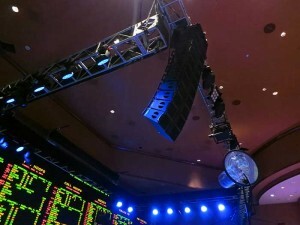 When MGM Resorts began researching and seeking out a new portable sound reinforcement system, the primary requirement was that it would perform exceptionally for every property in the family--a mean feat considering that each hotel and casino has its own crew and gear complement that a new system would to have to "play nice" with. Enter MGM Resorts production supervisor Shad Groverland who had been tapped by director of production services Sid Pike a couple of years ago to head up an effort to unify systems across the entire company. "We were spending a lot of money on gear rentals," notes Groverland. "For example, Bellagio might have a large corporate event for which they needed more of a rig than they had in their own stock, so they would rent something from a local provider. Meanwhile, the gear they needed might be sitting unused at The Mirage." Getting everyone on board meant, first of all, finding a system that everyone would be satisfied with. After extensive talks with crews throughout the chain, the name L-Acoustics rose to the top. "We needed a system that was rider-friendly, quick to set up, natural sounding with any type of sound source and, most importantly, something that all MGM Resorts property sound departments could agree upon," he says. The resulting system--comprising 24 KARA cabinets and eight SB18 subs, all powered by six LA8 amplified controllers housed in a pair of LA-RAK touring racks--has now been in service for a few months and is an unqualified hit with both clients and crews. Standing in the corporate production facility located behind The Mirage resort, Groverland says, "This is where the KARA rig would be if it was in the warehouse. But it's almost never here; it's literally out on a show 80 percent of the time." Those working events at Vegas' largest resorts are used to being asked to do the seemingly impossible. Odd requests are common and the words "can you put the speakers in the middle of the pool" are not something they are shocked to hear. "The KARA rig sets up quickly and is easy to move from one property to another," Groverland sums. "It's versatile and sounds great. It makes everyone happy, from crew to clients, and that is no small feat. KARA was the perfect choice for MGM Resorts."